On November 15, oikos Alumni came together for the fifth Alumni Debate in Zurich, Switzerland. The developments on the intersection of urbanization and digitalization were at the center of the debate. 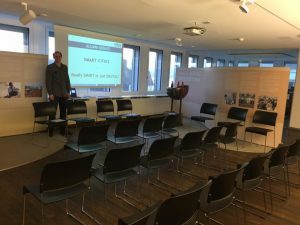 Because the way we live in cities is drastically changing, oikos Associate Christoph Rappitsch chose the rubric Smart City as the vantage point of the discussions. What are the innovative technologies which will rebuild the foundations of housing, mobility and energy and form Smart Cities? The debate started with a discussion on how much technology is needed for our homes to save energy and how much could and should be done with analog methods, e.g. turning down the heat and switching off lights. Even though the panelists all work in the energy industry that is under heavy pressure to implement the newest technology, points of view on the matter diverged. Expectedly, the argument emerged that we need technology, if only to remind and “nudge” us to live more sustainably. On the other side, technology would need agents who are aware of their actions and act responsibly. And to put it quotable, the most important aspect of a Smart City are Smart People. The discussion then moved into the technical realm: how should and could houses be designed? The best solution, it emerged, would be a combination of the newest measuring tools for energy and electricity, together with smart design and materials, which are able to keep the house cool or warm without additional energy input. The next big topic covered was mobility. The discussion centered around how technology can improve the situation from an environmental perspective: reducing emissions by car sharing; reduce inefficiencies via smart mobility apps; make traffic more efficient in cities via navigation tools; making the use of existing infrastructure more convenient. The last topic covered was the role policy makers should play in the transformation to a Smart City. They should offer incentives for creating a sustainable infrastructure (solar panels, loading stations for e-cars, financial support for efficient buildings, etc.) and should foster the change towards a more sustainable way of living in a city. The debate could be watched live on Facebook, where it is still available on our page. We thank again to the panelists and all the participants (offline or online), who joined us for this debate.